No that is not a swear word 😉 honest! Every year I contribute a pattern or two to a Ravelry KAL group called the Bleeping Sock Games. It is a sister group to the Scary Sock Games KAL group. Scary Socks all have horror films old and new as inspiration for the patterns and the Bleeping Socks have computer games. The members of the group compete to complete all the socks every year with points given for finishing, original photography and all sorts of other things. I never have time to compete, but every year I try to produce something to make them scratch their heads when it comes to construction or stitch pattern. Over the years I have covered Tetris, Zelda, Farcry 3, Uncharted and others. This year because of design pressures elsewhere, I have only managed the one sock. This sock is a bit different and is inspired by the steampunk/Puginesque look of the game. This is a sock I could easily see Evie wearing. 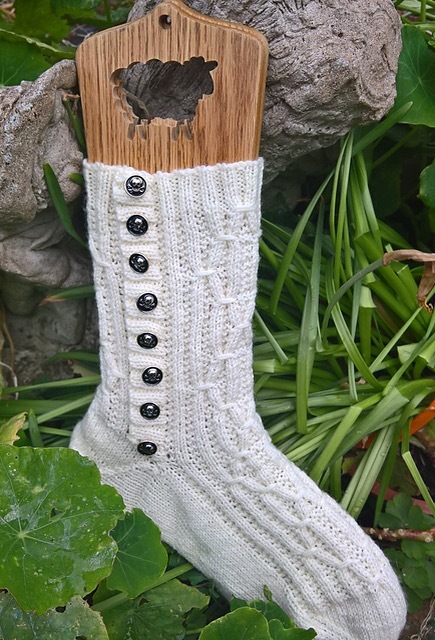 The Cuff and the leg of the sock is worked flat before joining in the round to work the short row heel and then the foot. A faux button band is then worked up the side of the leg and the sock is seamed. Finally, a row of bad assed skull buttons are sewn on to add the final touch. The pattern is much less complicated than it seems and is basically a ribbed pattern with a few wrapped stitches thrown in for good measure. Oh and there is even a picture tutorial on how to do those included in the pattern. The sock is currently exclusive to the members of the Bleeping Sock Games Group, hence the ridiculous price on it to discourage others from buying it until it is available to the general population in a few weeks time. It will go on general sale at $5 at the beginning of June, once the completion is finished. Meanwhile it is back to the test knit of Heidi, nearly there, knitting clue 10 of 13. Also a beaded scarf that showcases the gradiance yarns of The Unique Sheep that will be an exclusive kit from Earthefaire soon. My beads arrived today for Boo Knits Danse Macabre mystery KAL. ( I love her patterns ) Not that it is much of a mystery any more. The KAL started at the begining of April and I have been collecting the clues into Knit Companion while waiting for the beads to arrive. This too will have to wait until my test knits are done. Next time I will show you how I am getting on with the beaded scarf, it it so pretty! And not a yo in sight, so it is something for the non lace knitters, or someone who is looking for a simple pattern that doesn’t require much attention. I got a whole lot done at the hairdresser earlier this week. Time to turf the cat off my knee and get some work done. I love this sock and can’t wait to make it–I have no beads and currently not permitted to drive (post-op), so until then, I can only just keep looking at it. Hmm…will I cast on before you are able to finish sock two? Thank you for contributing as a designer to both of those contests–I don’t actually see myself as a competitor there, as I can barely make 1-2 of the designs, but I love the patterns and I love the photography (I”m pretty bad at that aspect) and I just think the people in the group are great! ← Now at Knotions a New Design!